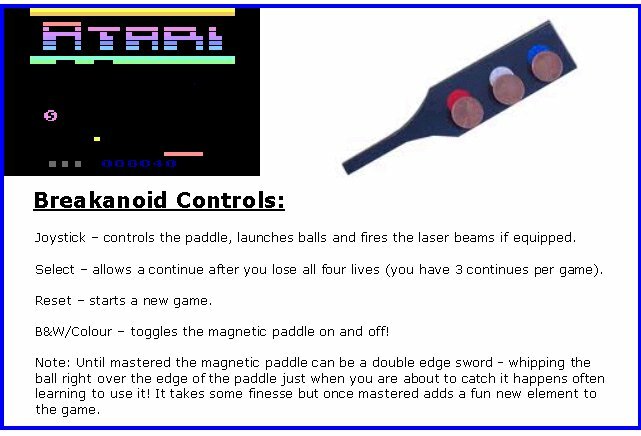 This Arkanoid style sequel turns up the action with a magnetic paddle to bring a new level of fast paced fun to the Pong genre! The ball still follows the laws of physics, but you can put English on it; throw a curve ball or whip it around the corner or over a ledge - it's like having an elastic leash on the ball! Here is a clip of BREAKANOID playing on a real 2600! The sound and gameplay are captured well enough to see the difference from the emulator but the animation and phosphor trails can't be filmed properly off of the CRT television - at 15 seconds the action gets so fast the camera is unable to track the ball and drops frames instead of showing the fluid animation. 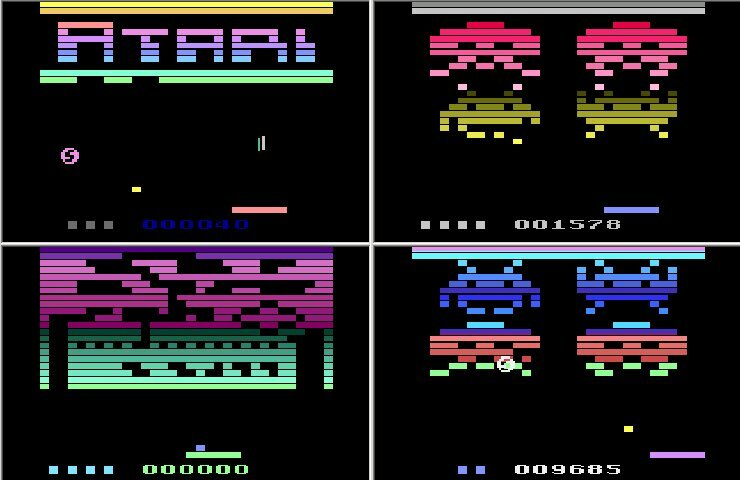 The demo includes the first three levels from the game, download it to play BREAKANOID anywhere - in an emulator on your phone, your PC or on a real Atari 2600 via a Harmony cart! 1. 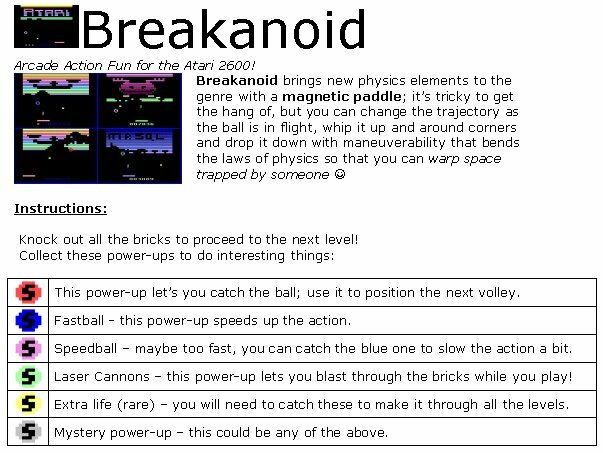 The full version of BREAKANOID with all 15 levels unlocked! 2. The alternate levels version of BREAKANOID! The alternate levels version features three winning level designs from the AtariAge community (thank you tremoloman!) and several levels designed by the BREAKANOID beta testers. The BREAKANOID Construction kit runs on the windows platform and outputs a new BREAKANOID binary - it lets you edit the level designs right inside the BREAKANOID ROM image to construct entirely new and unique BREAKANOID games! In addition to letting you design your own levels for BREAKANOID you can edit BREAKANOID's huge 160 entry colour table; BREAKANOID is a colourful game and can display up to 35 colours on screen at once and stores different colour themes in it's colour table. Pixel artists will be able to create pleasing fades, mosaic and rainbow patterns with the BREAKANOID Construction Kit to go along with their artistic level designs. 4. Rights to put BREAKANOID on one cart: . . . but which BREAKANOID? I've been asked about offering BREAKANOID on cart directly but AtariAge currently performs this service for $25 and this gives Atari fans a lot more flexability to choose which BREAKANOIDto put on cart - you can decide to put the Alternate Levels version on cart or select one of your own custom versions that you've built with the construction kit - pixel artists may create special one-off carts that become collector items! BREAKANOID comes with instructions that can be used as a colourful cart label (great reference to have right on the cart), a control sheet and instructions for the BREAKANOID Construction Kit. 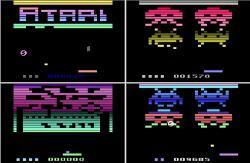 BREAKANOID is a fast paced arcade style action packed fun game for the Atari 2600 that I've been wanting to play since the 80's, but this type of game only appeared on other systems. During the 80's I wrote video games under my own label and for many software houses. I loved playing the games as well as writing them and was a big fan of the 2600 because on it's good games, the action was unrivaled - the games were fast, colourful and had great arcade sound effects. This sequel changes the rules adding tilt like in pinball, bringing a new level of fast paced action to the genre. The ball still follows the laws of physics, but you can put English on it provided your paddle has room to move; this is great for throwing a curve ball up into the upper reaches of the board to hit those last stubborn bricks or to whip the ball around a corner or over an edge into a structure where it can get stuck bouncing around so you can have fun watching it break out! It's like having an elastic leash on the ball. 1. 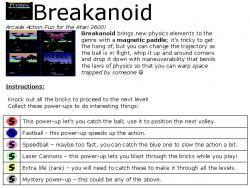 The BREAKANOID binary, full version with 15 levels. 1. Rights to have BREAKANOID put on one cart. 2. A level editor to create new BREAKANOID levels! 3. A second BREAKANOID binary containing an alternate set of levels created here on the AtariAge forums; I am holding a design contest - please see the homebrew discussion forum thread for details! The playable demo is a fully functional preview containing the first three levels of the game, I hope everyone enjoys the action as much as my beta testers did! This game was tremendous fun to build and I'm looking forward to everyones feedback! Saturday December 17, 2011: Added the option to continue up to 3 times (via the select switch) after the game ends or start a new game. 1. Made the magnetic paddle optional - you can toggle it on and off during play (colour/b&w switch). 2. Losing a life now freezes the game briefly so that a new ball cannot immediately be launched. 3. Screen roll shake and shimmer should be vastly improved on the real hardware! 4. The super speed power up is now reduced to medium speed when you lose a life (staying in speedball mode was too hard). 1. Added special yellow power-up's for extra life (rare). Edited by Mr SQL, Thu Jan 26, 2012 7:31 PM. Just tried it on Stella, seems like the ball physics are off? Almost like the ball follows the paddle? Yeah, gotta agree... it's like the paddle is magnetic, so if the paddle is even remotely close to the ball, the ball gets drawn towards it. Huh? I'll buy it on a cart with a nice label. If you do a release like that, then I'll be into it. $20 would be a great price on a cart, but I'd pay a little more like most members here would. Yes, this is the elastic leash! You can use it to whip the ball aroud and change the angle slightly. It lets you bend the physics a bit - try playing through the three levels and using all the items and let me know what you think of the effect; my beta testers thought it was wierd at first but loved the effect after a couple of games once they'd learned how to use it. I had my paddle on the left side of the screen, the ball was headed to the right side of the screen and it still landed on my paddle. How do you die in this game? Edited by rmaerz, Thu Dec 15, 2011 10:19 PM. I'm glad you like the game, thanks for the feedback! Judging from your username it looks like you are a fellow fan of this genre? I am planning to create a label design from the contest thread (for the alternate level set) but right now have no plans to ship it directly on cart though that may change; AtariAge currently offers a service to take the label and the binary and produce a cart for $20 or $25. that shouldn't happen, I'm thinking maybe you had the button pressed down and just launched another ball after your paddle missed it? You only have four lives, but you have the option to keep on playing forever after you lose them. I was going to turn this off but the beta testers said keep it. Curious if anyone can make it to the third screen without losing all 4 lives? Haven't tried out on my Harmony yet but I was seeing some weird physics in Stella! This game is pretty sweet. I really like it. I actually have no problem w/ the magnetic paddle. I do, however, think that after you run out of extra lives you should end the game or offer 1-2 continues. Allowing player to continue to play indefinitely defeats the purpose of having extra lives. Thanks Brian! Excellent points; what do you think of a difficulty switch selectable option to toggle between endless lives demo mode and ending the game when the lives are exhausted for competitive play? looking forward to hearing how it behaves on the real hardware! - fingers crossed The elastic leash on the ball is what lets you bend the physics a bit, helps you aim and do some interesting things once you get used to it. Changes a bit too once it turns into speedball. I will try it out using my Harmony cart. I'd support a cart release also. I'll give it a go with Harmony over the weekend. Add me to the pre-order list too please. I just tried this using Harmony and a Sunnyvale Heavy Sixer. Every time the ball hits the bricks, the entire screen jumps and even flashes for a super brief moment upon contact sometimes. Nice little game... Breakout type clone, similar enough to Arkanoid, that uses digital controls ala a joystick instead of analog paddles and a semi user-controllable erratically behaving ball. Ummm, okay. Neat concept, but would be nice if that type of ball behavior was a handicap or kids option instead of being a staple. Bat/paddle could be cut in half too for added difficulty. I like the idea of creating your own brick pattern though. Edited by save2600, Fri Dec 16, 2011 8:40 AM. I'd like to be added to the pre-order too! Thanks! That's what it was. I was expecting a notification that the game was over. Can you put a notification up on the screen e.g. "Continue Yes/No"
I like the game a lot! I do think you should be asked to continue and then reset the users score. For me it seems that once I miss the ball the new ball shows up too quickly on the paddle. Sometimes It feels like I didn't miss the ball and all of a sudden it's stuck on the paddle. I agree with tremoloman2006 that you should be asked to continue and then reset the score. Edited by NML32, Fri Dec 16, 2011 10:12 AM. Definitely interested in buying this, ideally on cart. (The new demo binary is in the opening post). Edited by Mr SQL, Sat Dec 17, 2011 10:59 AM. How bad is the brief screen jump and flash on the real hardware? Does it break playability? I wish I could see it - on stella the brief flash only kicks in when you are using the laser cannon to blast the last row of bricks which made it a cool effect but it's rock solid otherwise; I will tune it so the hardware more closely matches the emulators performance. In my opinion you really need to test the game yourself on real hardware before you have carts made and ship it. How bad is the brief screen jump and flash on the real hardware? Does it break playability? I'd say it "ruins" the game as it's definitely annoying and as a player, you know it shouldn't be there. Especially on what one would expect out of a professional/commercial release.